Review Context: I love the roguelike genre and I am a big fan of twin-stick shooters. This game is right up my alley. 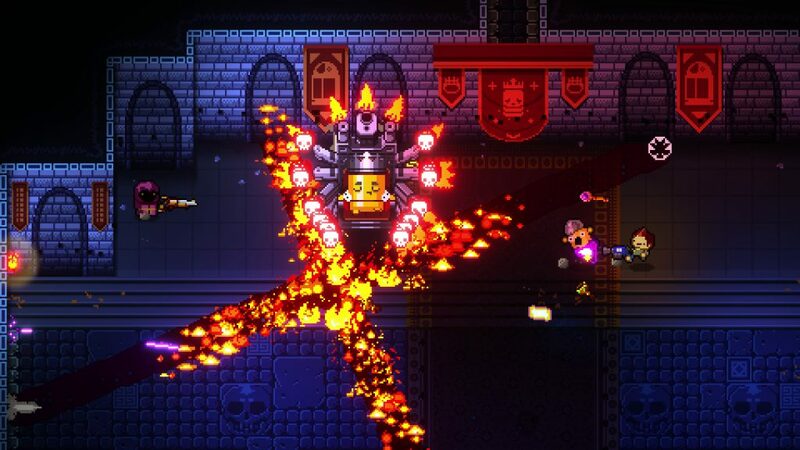 Enter the Gungeon is a top down, twin stick, shoot’em up rogue-like about adventures attempting to acquire a legendary gun that can kill the past. 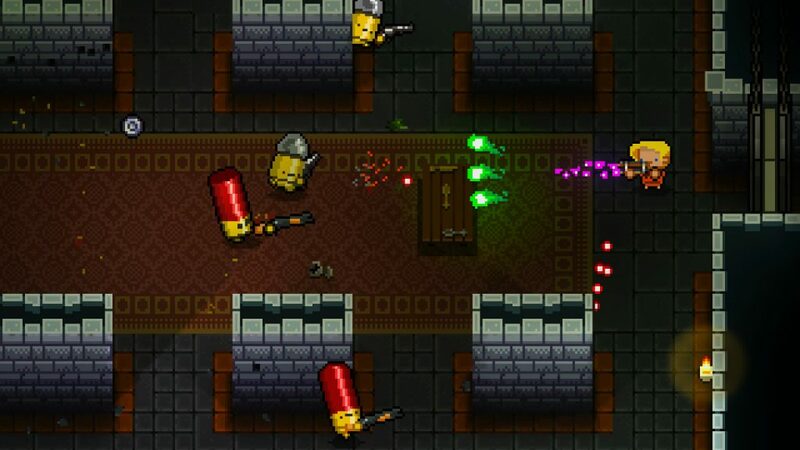 The Gungeon is a gun themed, randomly generated gauntlet filled with enemies, traps, shops, and bosses. With an expansive arsenal to be discovered you never know what you are going to find. Can you dodge roll your way to victory? Well, grab a gun and lock n’ load because it’s time to Enter the Gungeon. Enter the Gungeon’s main feature is the weapons. On top of having a bunch of passive and active items, just like The Binding of Isaac, there are over 175 different guns that can be found, as well as four different starting characters with their own starting weapons and passives. The amount of creativity that went into making these guns is noticeable as you can find anything from an RPG to a knock off Mega Buster, to a unicorn horn that vomits a colorful rainbow beam, not to mention all of the cultural references. You can carry as many guns as you can find, but you can only fire one at a time, which changes the pacing significantly when compared to other roguelikes. Where as other popular roguelikes like The Binding of Isaac and Our Darker Purpose allow the player to stack up a bunch of items that can create runs that are super powerful and basically win the game for the player, Enter the Gungeon never really gets that out of hand. Each weapon you collect doesn’t raise your overall damage like damage items do in The Binding of Isaac, and you can only use one at a time so it doesn’t matter how many good guns you get, you’ll never get OP. Not to say that having the game almost win for you is bad, it’s usually a lot of fun while it lasts, but Enter the Gungeon is a lot more skill focused. It’s more about dodging and not getting hit than it is collecting enough good items to win. You can even flip tables over to give yourself quick cover. You can still get good guns and items, and you can occasionally find a super powerful synergy that makes the game significantly easier, but it will never just become easy mode like The Binding of Isaac can. The game even goes so far as to reward the player with a health upgrade for beating a boss without getting hit, emphasizing its focus on a high skill cap. Skill you’re going to need to make it through the later stages. Veterans of the genre will enjoy the challenge, while at the same time there is still plenty of fun for people who aren’t so good at the game. One of Enter the Gungeon’s most important features is the dodge roll, hence the name of the developer, which is a rolling lunge in any direction that makes the player invulnerable for its duration. Not only does this make the aspect of dodging more dynamic and interesting, but it allows enemy attacks to be much wilder and more crazy than usual. Some boss fights even cross the line into ‘bullet hell,’ which is not only exciting but awesomely fun. One of the other key features of the game is that all the guns require ammo except for your starting pistol. While this places an emphasis on being ammo efficient when you fight, it also means that there will be times when you have to use your starting pistol because no ammo is dropping. This is when your dodging skill really comes into play, as you can’t rely on a powerful weapon to burst enemies down before they hit you. The aspect of a roguelike that most people forget about, even developers themselves, is progression. It’s easy to think that roguelikes don’t have any progression because you start each run anew, but that is not true, especially for Enter the Gungeon. Beating bosses grants you “Hegemony Credits,” which can be spent at shops in the starting lobby, otherwise known as “The Breach,” to unlock new items and guns. Once unlocked, these items now have a chance to appear in the Gungeon. These different kinds of shops can be unlocked by finding NPCs in the Gungeon. These NPCs can be sent back to The Breach by either rescuing them or performing a task for them. Sometimes these NPCs will even show up in the Gungeon itself after being unlocked and provide new shops or extra challenges to gain. Lastly, in terms of progression, there is a secret final stage and boss that can be unlocked, though it is very difficult, as well as two extra playable characters. The means by which these are unlocked are convoluted and difficult and I will not spoil them here so good luck! Part of the fun of a game is learning its ins and outs, as well as its secrets. Not only does Enter the Gungeon have a high skill cap, but it has plenty of secrets too. 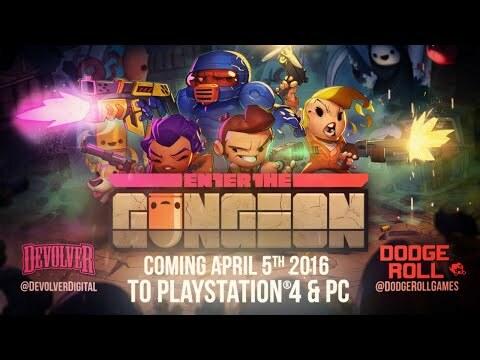 Enter the Gungeon looks and sounds great as well. Its cartoony pixel art style is at the same time fun and cool, fitting well with its silly yet difficult nature. Enemies range from adorable to intimidating, and there is never a plain space in the levels. Rooms are always filled with random clutter and destructible objects that make spraying and praying more fun. One small issue is that it can sometimes be hard to distinguish holes in the ground from rugs. There are pits that the player can fall in and they are usually black, but due to the cluttered pixel art aesthetic it can be easy to not notice these pits until it is too late. Fault resides as much with the player also, as after making that mistake several times I learned pretty quick. One of my favorite things is that Enter the Gungeon has local co-op and not the kind that The Binding of Isaac has where player two can barely do anything. This has full-fledged two player mode which honestly makes the game harder, as it doesn’t increase the money or drops so you basically have to share. The only caveat is that player two can only be one special character specifically designed for co-op. Not a big deal as it’s basically a middle of the road character with a one-time use revive item which is super good for co-op. When one player dies they drop all but one of their items, and that one item unfortunately disappears as a penalty, and they become a ghost. This ghost can move around and release little shock waves that block bullets. That way they can still participate even when they are dead, which is great because no one likes to sit out! Players can be revived by finding a chest, which turns into a revive chest if a player is dead or by beating a boss. In conclusion, Enter the Gungeon is a well built game with few faults to be found. Solid controls and good randomized level design make for a pleasurable, if not challenging experience. The drawn out progression keeps the game interesting for people who aren’t too keen on replaying stuff and the local co-op is an uncommon, but definitely welcome feature. 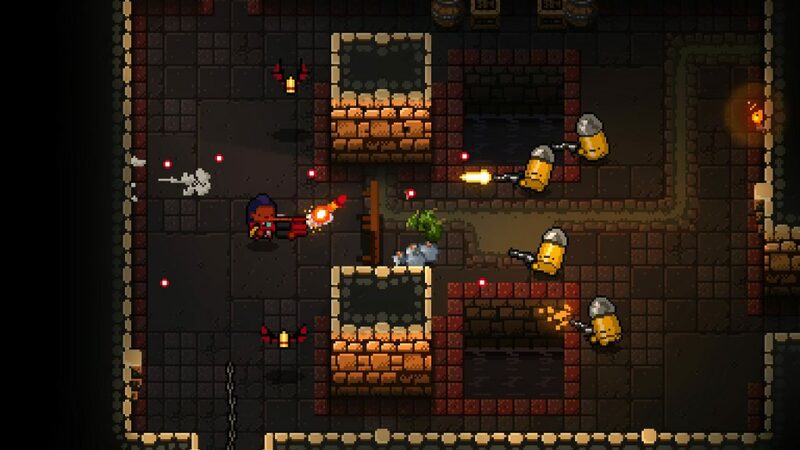 If you’re looking for a new roguelike, or are looking for a game to play in short bursts with a friend then Enter the Gungeon is the game for you.